This is a contribution to For the Love of Film (Noir): The Film Preservation Blogathon being led by Marilyn Ferdinand of Ferdy on Films and the Self-Styled Siren, Farran Smith Nehme, with assistance by Greg Ferrara of Cinema Styles. 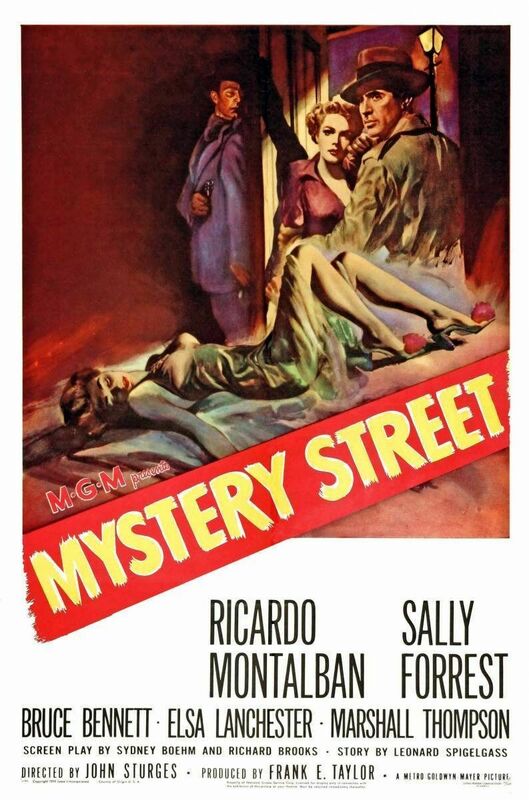 John Sturges' Mystery Street is often cited as more of a police procedural than a straight film noir. But because of my own Hispanic background I feel particularly attuned to why this is an oversimplification. 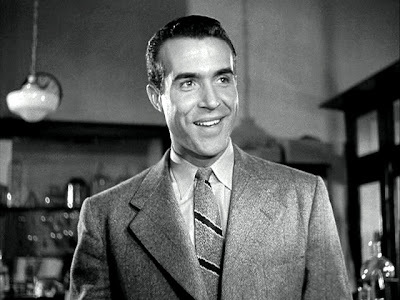 It's the unusual choice of a Latino for the lead that firmly ensconces the movie in the realm of noir. Mexican actor Ricardo Montalbán plays Boston police lieutenant Pete Morales, a compelling hero who seemingly plays by the book. In some distinct ways, though, he is as much of an outsider as your typical noir hero, marginalized by institutional racism both external and internal. Investigating the murder of bar-girl Vivian Helding (Jan Sterling), Morales initially greets his superior's order to consult with Harvard's Dr. McAdoo (Bruce Bennett) with a bit of skepticism. We see the first signs of Morales' racial self-consciousness when he and his partner get lost at Harvard while trying to locate the school's Department of Legal Medicine; Morales turns to his partner and says, "I thought I was the stranger around here." After introducing themselves to McAdoo, the doctor demonstrates the value of forensic science to the two cops. It is at this point that a subtle schism emerges for the attentive viewer. For many, the didactic sequences explaining the laborious research and deductive efforts of forensics identifies Mystery Street as a procedural. But the subtext is that the ambitious Morales finds a hook onto elevating his own career aspirations, and more importantly out of the police force's "racial ghetto", with the evolving science now at his disposal. 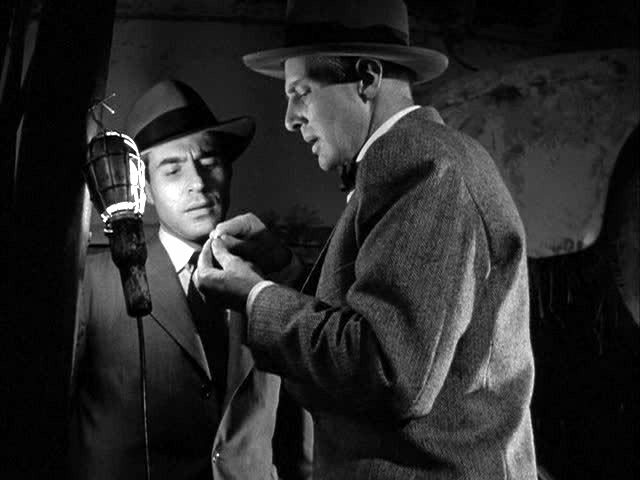 For instance, one can infer much into an early scene in which Morales admits this is his first murder case; his throwaway line, "Up in the Portuguese District, what I'm assigned is mostly small stuff," reveals his eagerness to transcend the limitations of his current position. It also hints at a subtle racism within the police force itself, alluding to the fact that Morales was assigned to an ethnic neighborhood despite the fact that its culture (and language) is presumably different from his own. This explains, in part, Morales' eagerness to accept McAdoo's strange investigatory innovations. It explains Morales' willingness to spend considerable amount of time doing legwork to enable such investigation—like when he starts along the time-consuming mission to determine which missing female's photograph matches the skull he found by collating the focal lengths, distances, and conditions in which each picture was taken. And it also explains his desperation and urge to cut corners and even disregard McAdoo's deductions as he gets closer to solving the crime, almost sending the innocent Henry Shanway (Marshall Thompson) to prison simply because he was with the victim on the night she was murdered. Morales wants to impress his bosses and move up the ranks of the police department quicker than his more experienced cohorts. A later scene in which Morales plays handball in the police gym is a glimpse into how he sees himself. 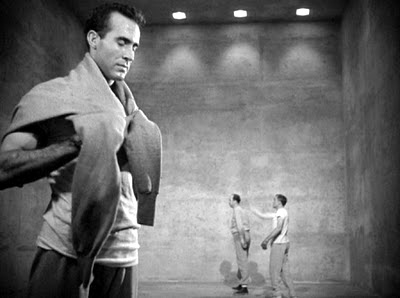 Sturges and cinematographer John Alton start the scene shooting through a chain-link fence, with Morales surrounded by the concrete walls of the handball court. He aggressively bounces the ball against each wall as two co-workers come in and invite him to play. They joke, "... still knocking down walls, huh?" It is a clear reference to Morales' transgression into "their" institution. Morales walks away under the pretense of working on the case despite having closed it with the arrest of Shanway. The still above shows how Alton's framing of Morales emphasizes his "otherness," his "separateness" among his peers even at what should be his greatest moment of triumph. Unwilling to embarrass himself if he should make a mistake, Morales increasingly visits witnesses and suspects alone, relying on his partner only for simple errands. Sturges codes characters both benevolent and evil by how willingly they accept Morales as an equal. 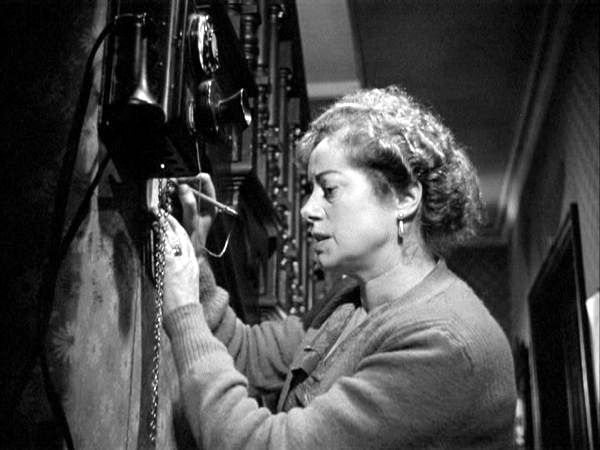 To the blue-blooded chief suspect, James Harkley (Edmon Ryan), and the victim's landlady, Mrs. Smerling (Elsa Lanchester), Morales is a reminder of ethnicity and lower-class. To most everyone else—the victim's flatmate (Betsy Blair), Harvard's Dr. McAdoo, and even the wrongly prosecuted Shanlay and his wife (Sally Forrest)—Morales is simply a cop doing his job, and ethnicity never even comes up. Contrasting depictions of the way an immigrant works to assimilate is illustrated best comparing the upstanding Morales, who tries to work within the system, to the nosy Mrs. Smerling, who seeks acceptance into society by trying to subvert the system. Smerling is the only other character in Mystery Street saddled with an accent that identifies her as an outsider. Compare her visit to Harkley to Morales' interrogation of the man much later. Mrs. Smerling tries to insinuate herself into Harkley's social class with fancy clothing and erudition before being dismissed by him with a simple, "Madam, the bus leaves in about ten minutes, or one of my truck drivers can take you back to town..." This emboldens Smerling to blackmail Harkley, an ex-boyfriend of the dead bar-girl who Smerling can incriminate. Morales' visit with Harkley goes much different. Morales uses his undeniable legal affiliation to probe into Harkley's whereabouts on the night of the murder. With no easy way of countering Morales' invasion into his private affairs, the fearful Harkley attacks the cop with not-so-veiled racism, "There was a Harkley around these parts long before there was a U.S.A. You can ask anybody. But from the way you talk, you haven't been around here long...You know, I'm used to respect, people looking up to me!" To which Morales responds, "So am I Mr. Harkley! And my family hasn't been in this country for even 100 years!" The Boston setting then gains greater significance for it allows Sturges to pose the Hispanic Morales in strong relief against it. It fuels Morales desperation to overcome his status by solving this highly publicized crime. It motivates Morales to feel like an outsider during the course of his probe, giving him opportunities to both innovate and impress using McAdoo's new investigative theories. It influences Morales to be self-reliant, possibly to his own detriment, for it is only when his assumptions are re-examined by McAdoo and/or Morales' partner that the investigation moves forward. This is the key to identifying Morales as a noir hero: the flawed character trait which is both an asset and impediment at times, that he must overcome to succeed in his mission. Mystery Street's finale, in which Morales finally catches up to Harkley at Boston's Trinity Station with the help of his partner, sees the lieutenant finally asserting himself AND accepting aid from a cohort. As he captures the murderer, incriminating him with a vital piece of evidence supplied by the victim's flatmate, it is the first time we see Morales confidently command one of his cops, "Take him in!" Please donate any amount you can to support the efforts of the Film Noir Foundation by clicking on the button below. The Film Noir Foundation is a non-profit public benefit corporation created as an educational resource regarding the cultural, historical, and artistic significance of film noir as an original American cinematic movement. It is their mission to find and preserve films in danger of being lost or irreparably damaged, and to ensure that high quality prints of these classic films remain in circulation for theatrical exhibition to future generations. What a great post, Tony, with a really original and personal take on this fine noir. The subtle ethnic subtext of the film is one of its most fascinating elements, and you do such a great job of teasing out an undercurrent that does mostly run below the surface. When I saw the film, I noted these hints of examination of ethnic/racial identity, but didn't take it nearly as far as you have here. The film seems much more interesting with the benefit of this deep reading - it becomes easier to overlook the undercooked "wrong man" business with the innocent fall guy and his wife, and to focus on what makes the film really interesting. I enjoyed your perspective here. I haven't seen the film, but I know when I do I'll recall your insights. Thanks! Even so, I have trouble believing Farran since, lover of hams that I am, I adored Montalbán as Khan. Thanks, Ed. High praise indeed from a knowledgeable writer who himself covered MYSTERY STREET a few years ago. Readers, click here for Ed's slightly different take on the film. Terrific take on this film, Tony. Years ago I had the pleasure of interviewing Mr. Montalban after a screening of his other great noir, Border Incident. It was my favorite interview of the many I have done; although tortured by agonizing back problems he was warm, witty and exuded what I can only call "nobility." And I will never forget how vehemently he scolded Hollywood for casting him as "Cubans, Venezuelans, Portuguese ... everything but what I am—a Mexican! Viva le Mexico!" I always say: imagine Touch of Evil with Montalban as Vargas! 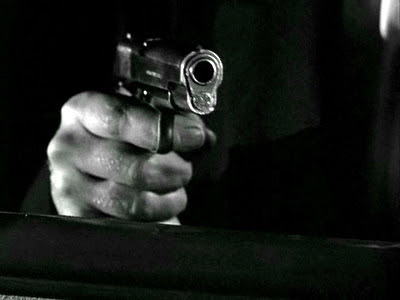 I watched a Montalban movie not long ago for my own Film Noir marathon. It was 'Border Incident' and I thought Montalban was the strongest actor of the bunch. 'Mystery Street' is evidently another film Noir that touches the issue of race relations (specifically in the United States). Was this a common thing for the actor to do, play in films with underlying ideas about race relations, or are those the only two? That pic in the gym looks stunning. Eddie, thanks for sharing your experience with Montalbán. As a Cuban American, I can relate very well to his resentment towards the dismissive "lumping in" of all Hispanics in one amorphous mob. Our respective heritages are very valuable to each of us. Also, I'd love for you to return here and link up to any of the interviews you conducted if they're online. Edgar, as far as I know, Montalbán was not prone to be an activist regarding race in his films. It was a different story in his personal life. Tony, thanks for bringing this film to my attention. I loved Montalban, and I'm going to check this out. Thank you, Tony, for a very interesting post on what sounds like a noir with an exceptional angle for its time. People make fun of Montalban because of the car commercials and Khan, but he could act when the material was worthy.